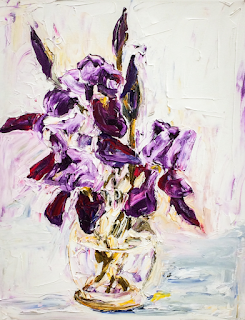 Irises with lots of movement and lots of paint. Lovely! Our irises are just starting to grow...no blooms yet. They're such a beautiful, singular-looking flower. I rarely ever comment but I have read your blog for years so I just wanted to leave a quick note to say how thankful I am for it! Thank you for sharing yourself with us! I'm sure you're very busy these days but I just wanted to drop a line and say how much I miss your regular updates. This painting is beautiful! Wondering if you have so much going on in your life right now that you don't have time to share....hope it is good things. Missing you. Have missed your inspiring blog entries, Ana! Hope you're just extra busy, but prayed today that God would be with you wherever you may have need.